1. Heart disease. According to a growing body of evidence, air pollution can increase the risk of developing heart disease. And for people who already have heart problems, exposure to high levels of air pollution might trigger episodes of chest pain, heart attacks or heart failure. 2. Diabetes. Exposure to air pollution has been linked to an increased risk of developing type 2 diabetes, according to a 2014 study published in the journal Diabetes Research and Clinical Practice. 3. Mental health. Some research has even suggested that air quality may be linked to symptoms of depression. Canadian researchers, for example, have reported a potential association between poor air quality and increased emergency-room visits for suicide attempts. Scientists in Korea have also found long-term exposure to high levels of pollutants in the air to be associated with increased levels of depressive symptoms among older adults in South Korea. 4. Developing brains. Research from Mexico City, where smog levels are high, has linked air pollution to brain changes and cognitive dysfunction in children. In the U.S., research funded by the National Institute of Environmental Health Sciences found that mothers exposed to higher levels of air pollution during pregnancy were more likely to have children that exhibited symptoms of attention-deficit/hyperactivity disorder. 5. Cancer. In 2013, the World Health Organization concluded that outdoor air pollution can cause cancer in humans. While lung cancer has long been connected to exposure to air pollutants, there’s also evidence that air pollution can increase the risk of developing urinary tract/bladder cancer. 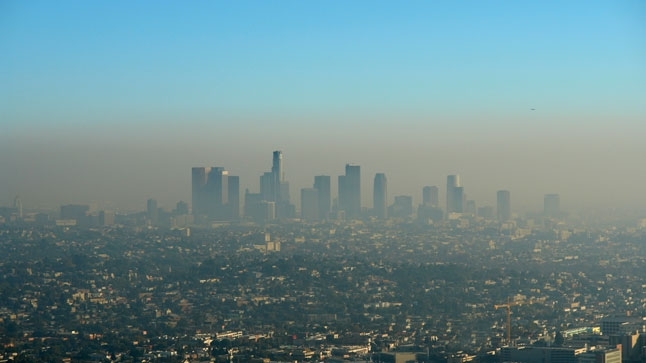 The bright side: Policies to improve air quality are making a difference. In 545 counties across the U.S., life expectancy increased as air quality improved between 2000 and 2007. And last month, researchers reported that as air pollution levels have dropped in Southern California over the last two decades, respiratory symptoms such as cough and congestion have dropped significantly in children with and without asthma. You can limit your exposure to air pollution by staying indoors when air quality is poor and avoiding areas of high auto traffic as much as possible.